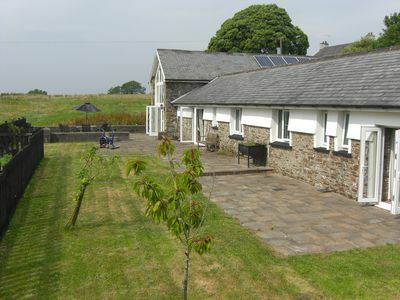 Substantial barn conversion situated in Five Roads, LLanelli. Very quiet, peaceful location, with wonderful views over the surrounding countryside and coast. The property consists of five bedrooms with five bathrooms and features lovely stone walls, beamed vaulted ceilings, a log burning stove, pool table, private patio areas and adjoining fields for pets and children to play in. Ramblers paths right on your doorstop and near to cycle paths and local reservoirs. Overlooking Ffos Las Racecourse, this wonderful property is an ideal base for exploring Llanelli and Carmarthenshire. Lots of activities and places to visit including the award winning Cefn Sidan Beach, described as one of Europe's best beaches with eight miles of golden sands, a hidden treasure within Pembrey Country Park.. Pembrey Park boasts a fantastic mix of traditional seaside attractions such as crazy golf and beach entertainers, coupled with more modern facilities such as an impressive dry ski slope, toboggan run and a charming miniature railway. Other places to visit in Llanelli include the WWT (Wildfowl and Wetlands Trust, Kidwelly Castle, Burry Port Harbour, and the Millenium Coastal Path. The National Botanical Garden of Wales and the beautiful Gower are a short car ride away.